Kenichi (Ken) Ohashi is a leading wine and sake industry professional based in Tokyo, Japan. In 1992, he started his career working for the family sake retail business – Yamajin co., ltd. He is now President of this firm, that has diversified greatly over the last 20 years. In addition to his commercial and educational responsibilities with Yamajin, he runs his own consultancy firm – Red Bridge co,.ltd. 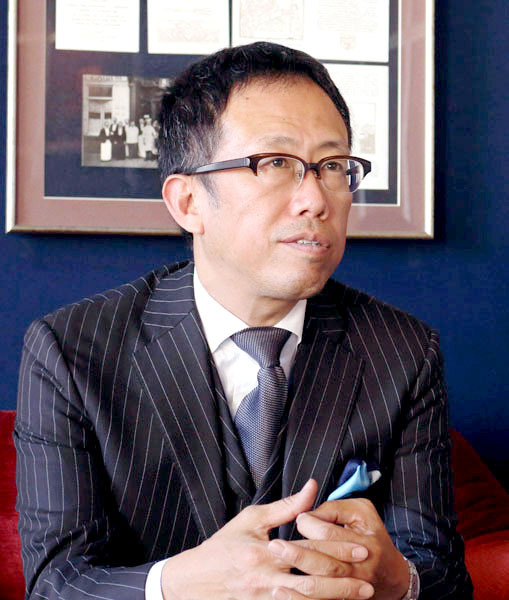 His activities in this business include, but are not limited to – lecturing, buying, judging, writing, selling and strategising for various Japanese and International liquor businesses. A key consultancy role within ‘Red Bridge co,.ltd’, is as Chief Consultant for Distribution to Wine Diamonds (an exciting new wine importation business owned and operated by Ned Goodwin MW). He is also the Managing Director of Somersault co,. ltd., a wine, sake and liquor wholesale group. In this role he buys wines and sake for over 60 wholesalers, wine bars and specialist retail chains. The pursuit and exchange of knowledge is at the heart of everything Ken does in his chosen profession. Since he joined the industry he has compiled an impressive list of qualifications. In 2008 he was awarded the highly prized Master of Sake qualification (there are currently only 200 people in the world with this qualification). Further evidence of his great expertise and reputation as one of the worlds great sake tasters is evidenced by his appointment as one of only 30 Sake Expert Assessor’s by the National Research Institute of Brewing (one of the highest accolades offered to sake professionals). He has been sake Co-Chairman of the International Wine Challenge since 2010 and has helped make this competition not only the best sake competition in the world, but the biggest – with close to 1,000 sakes tasted each year. His skills and expertise are not just limited to sake and he is also one of the most important opinion-makers in the Japanese wine market. Having been a pioneering force for the natural wine sector since 1997, when he convinced his family to diversify into wine, he wrote a book on the subject in 2004. ‘Natural Wine’ is still today considered the reference text for this exciting sector in the Japanese market. He obtained his WSET Diploma in 2006 and is one of only 20 Japanese to have this important qualification. In 2010 he was invited by Wines of Australia to study at the exclusive Landmark Tutorial. He contributed to The World Atlas of Wine 7th Edition – edited by Jancis Robinson MW (JancisRobinson.com) In addition, he was awarded the most prestigious The Personality of the Year 2016 by IWC (International Wine Challenge London). As a key wine industry commentator, Ken regularly appears in both the trade and consumer press in Japan and abroad. Ken is a unique individual with an abundance of energy and passion for wine and sake, He is friendly, polite and committed to quality in all that he does.